The main aim of the School is to provide a sound general education to the young boys and girls and to develop in them a secular outlook. 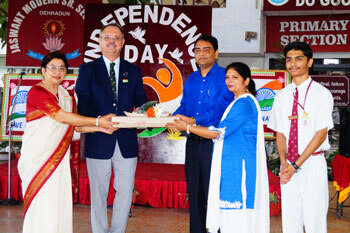 The School endeavors to make the students responsible, well disciplined, self-reliant, loyal & patriotic citizens. Punctuality and cleanliness are given special significance in the curriculum. The school also lays stress on physical fitness, sports, spiritual upliftment and the development of latent and acquired talents of the students. The crest of JMS is the Luminous Lotus. The Lotus symbolises purity of thought and action. The lamp signifies the light of knowledge & wisdom. Gurudev's words " Be Good Do Good ", form the philosophy of the Institution.